Goodreads says, "The perfect pairing for anyone with a literary thirst! From Jane Austen's little-known fondness for wine to Hemingway's beloved mojitos, literature and libations go hand in hand. Cocktails for Book Lovers blends these in a delectable book that will delight both readers and cocktail enthusiasts alike. This irresistible collection features 50 original and classic cocktail recipes based on works of famous authors and popular drinks of their eras, including Orange Champagne Punch, Salted Caramel and Bourbon Milkshakes, and even Zombie Cola. So dip in, pick your favorite author or book, and take a sip--or start at the beginning and work your way through. Cheers! 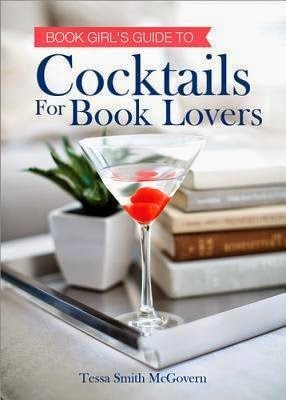 Cocktails for Book Lovers is more than just a recipe book for cocktails; if you are like me and love all things literary, you'll love the wealth of information in this book. It includes fifty original and classic cocktail recipes based on either the author's book or a popular drinks from the time period. In addition to the recipe, it includes the author's biography, a quote from one of the author's books, the cocktail recipe and another book suggestion/blurb. I wasn't expecting to learn something from a cocktail recipe book, but I did! For example, who knew that Jane Austen was "a sophisticated reveler and wine drinker?" She sounds like my kind of girl! Here are some of my favorite authors and cocktail pairing from Cocktails for Book Lovers: Jane Austen and Miss Austen's Delight, Emily Bronte and Heathcliff's Crush, William Faulkner and Mint Julep, F. Scott Fitzgerald and Gin Rickey, Ernest Hemingway and Mojito and lastly, Zora Neale Hurston and Orange Blossom. There's something for every literary fan in here. I tend to gravitate towards classic authors, but there's contemporary authors in this book as well, such as Matthew Quick (Silver Linings Playbook) and Beer Margarita. For me, there's nothing better than pairing literature and cocktails. This would be the perfect gift for that literary lover in your life or for your book club. It would definitely be fun to create the cocktail that goes along with the book/author you are studying. That is an assignment any book club gal would enjoy. 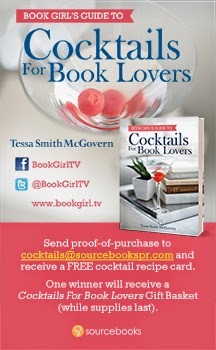 Thanks to Sourcebooks, I am able to host a giveaway for one copy of Cocktails for Book Lovers to a US reader. The deadline is August 8th and please refer to my giveaway rules. Now excuse me while I dream of Ernest Hemingway, Key West, and drink one of his famous mojitos. LOVE IT!!!! I'm absolutely getting this for my mother in law so she can make some of these cocktails for her book club (and herself ;-) Thanks so much for bring this to my attention Christina! I know, right?! This book is so up my alley. I'm glad your MIL would like it, too. Thanks for visiting, Jenny! Ha! I like the idea that you get to know more about previous authors along with recipe ideas for cocktails. I know someone who would love this book! It really is a cool book and perfect for literary and cocktail lovers. I can't wait to try some of the fun recipes in this book. Thanks for visiting, Nick!